Welcome to week 7 of the Crypto Alert of the Week series by AMLT, a series dedicated to documenting interesting or high profile frauds/hacks etc that recently happened and have been reported into the AMLT Network and show how the AMLT Network can help track and prevent it in the future. During 2018 there have been a few high profile cases of Smart Contract vulnerabilities related towards what are called OverFlow Bugs. Simply speaking an OverFlow Bug is a vulnerability in an ethereum smart contract that allows the creation of tokens out of thin air through a hidden bug or lets say a badly written smart contract. Some developers and hackers are aware and are trying to take advantage of smart contracts related to tokens and ICOs that have this vulnerability. Depending on the situation, it is hypothetically possible for the person who takes advantage of this bug to liquidate the new tokens they created through an exchange before anyone is aware or can do anything about it. A second potential way of maliciously using this vulnerability is to purposely deflate the price of a given token to either just simply damage the project or to buy large amounts of said token at the very low price to maximize potential ROI. Some tokens that have been a victim of such an action has been SmartMesh. The SmartMesh team reacted quickly and cut out access to these newly created tokens. The industry has reacted to some of these cases by temporarily suspending deposits while auditing whether other Smart Contracts had the same issue. In cases of bugs like this, anyone who notices the activity can report it through an AMLT panel or widget, once received the data is analyzed and processed by the Coinfirm data team. If data is deemed legitimate it is implemented into the Coinfirm AML Platform, allowing any entity using the platform such as an exchange to not accept the fraudulent tokens. 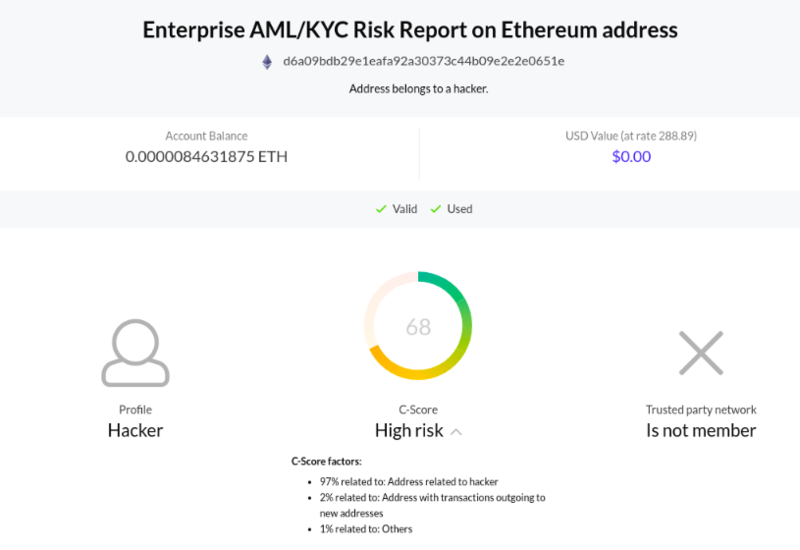 As an action such as this would be done with an intention to at the very least disrupt, the related address and entity that took advantage of the vulnerability the Coinfirm AML Risk Report for it has an elevated risk rating, a new identifier as well as risk indicators. In case you don't see the AML/KYC risk report below click here.